Amy's Creative Pursuits: Snowy Winter Day Outfit...On The First Day of Spring! 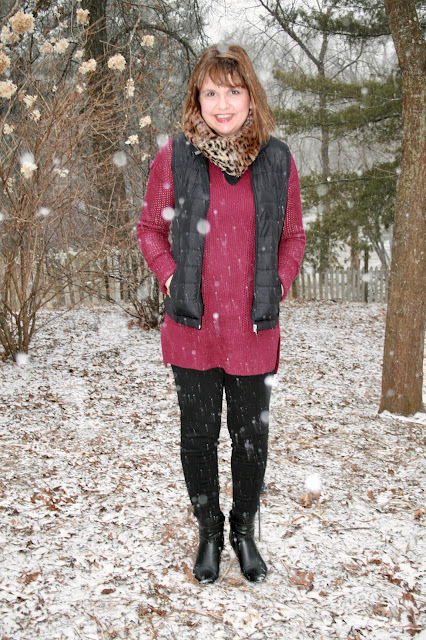 Snowy Winter Day Outfit...On The First Day of Spring! This is my last winter fashion post of the season. I don't care how cold it gets. I don't care if we get dumped on with yet another blizzard in April. I refuse, I absolutely refuse to do one more winter fashion post when it is officially spring. This is why I get SO MAD when all the fashion bloggers start screaming "I Love Fall" and wearing their chunky sweaters, tall boots, and blanket scarves in August...because in Wisconsin are winters are long enough. I will not make them any longer by dressing for it in August. Anyway, rant over. These pictures were taken last week Sunday. On the first day of daylight savings time. I wore it to see a matinee with my husband, lunch, and then some shopping. When we got home, it was still light enough to take pictures, but then it started to snow, like crazy! But it ended up giving us some very nice pictures and hopefully a pretty final farewell to winter. Everything I am wearing is old. I know, I'm beginning to sound like a broken record. I didn't buy a whole lot of new winter items this season because there weren't a lot of new styles and I already had more winter clothes than I knew what to do with. I did do a major overhaul of my closet and got rid of about 1/3 of my clothes. I donated basically everything that didn't fit well, was uncomfortable, made me feel unattractive in it, or I simply tired of. I then took inventory of my closet and started buying some new spring pieces; mostly pants and tops. I came to the conclusion that I only liked stretch denim and I also wanted higher waist pants. I'm tired of wearing the low rise that use to be so popular a few years back. I need to 'tuck it in' if you know what I mean. I also find regular denim...how they used to make jeans...now so uncomfortable and I only want to wear the stretch denim. This is a long tunic sweater that I last showed you HERE. 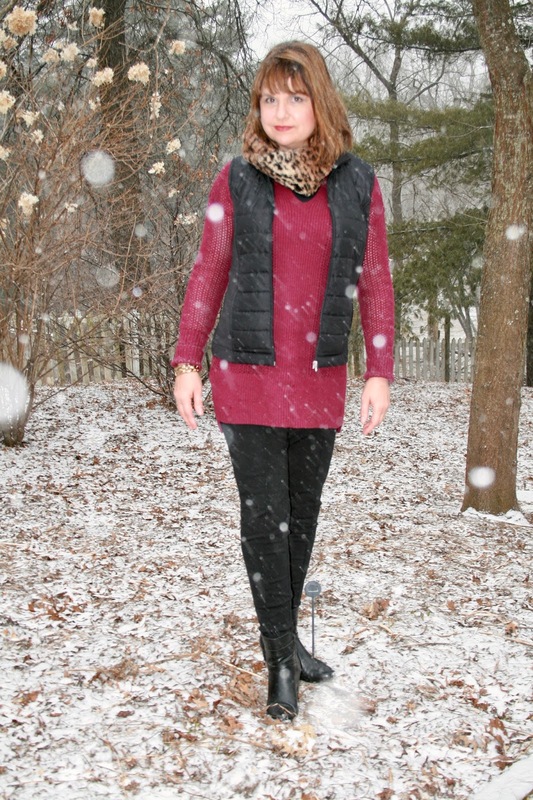 This time I paired it with black ponte knit pants (Worthington, JCP), and an old black vest. The vest is super thin so it doesn't add a lot of extra bulk but still keeps me warm. I often wear it around the house on cold winter days. The last time I showed you this vest was HERE. The sweater is a Medium Tall so it's extra long. Sweaters can't be long enough in my opinion, especially if I want to wear them with leggings. 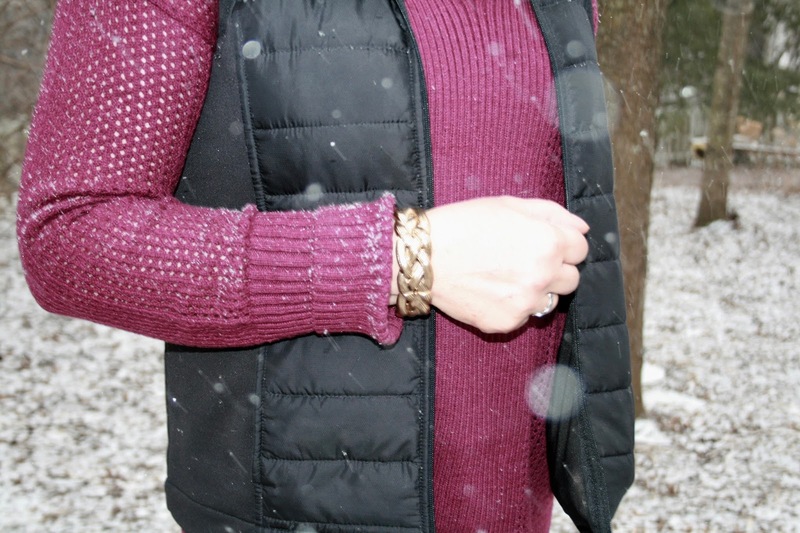 Because I wore a scarf, the only jewelry I had on was this gold bracelet from Charming Charlie's. The vest is only quilted in the front which really eliminates extra bulk. I own three winter puffer vests. 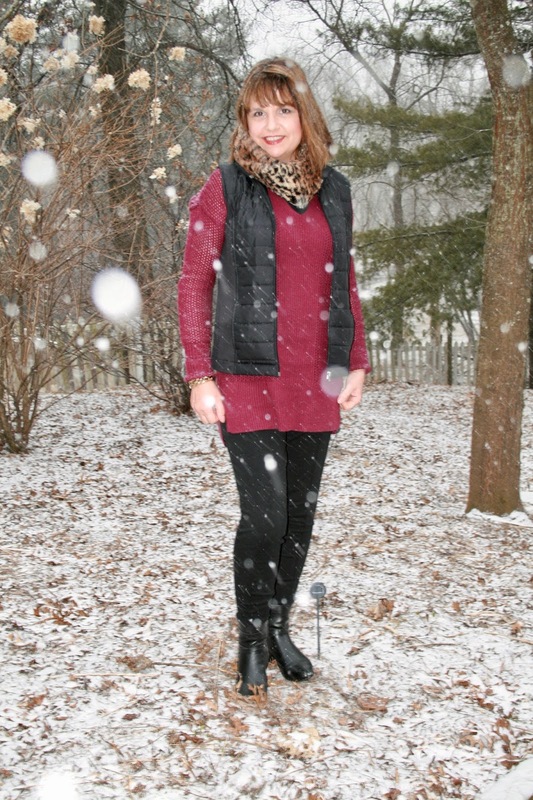 This thin one, a medium weight white puffer vest, and a very thick burgundy puffer vest. I think it's important to have a variety of puffer vests in different thicknesses and colors because I used all three of them for different purposes. This vest I wear either indoors or when the weather isn't that cold. 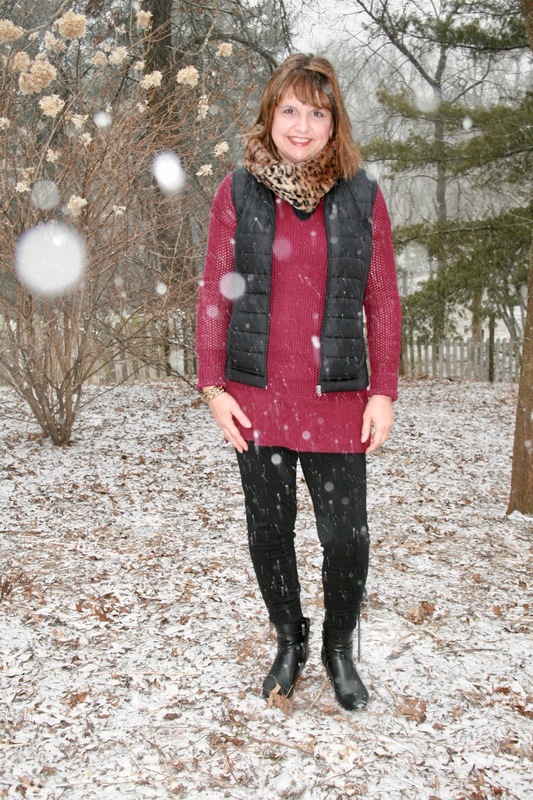 In contrast, my burgundy thick puffer vest I practically wear as a winter coat because it's so toasty warm. I absolutely love these fur infinity scarves. They are so soft and toasty warm. I have three of them, this pretty leopard print scarf, one in tan, and one in black. My ankle booties are by Liz Claiborne sold at JCP a few years back but they still have similar styles available. And that's it for my very last winter fashion post of the year! See you on Friday with a spring fashion post...warm weather or not! Happy Spring!! Love the burgundy sweater and the scarf looks really cute with the outfit! Looking forward to some spring outfits on your blog! Happy Spring to you too Elli! I'm looking forward to wearing spring clothes! So tired of sweaters and scarves! I'm so with you on being done with winter!!! I look forward to your Spring clothing posts. Have you had any luck finding stretch, high waist denim? That is exactly what I'm looking for! I'm tired of low waisted pants that always feel like they are sliding down....or giving me a muffin top! Thanks Karen. Me too. It wasn't a very cold winter this year, but it seems kinda long this year. As far as finding high waist denim yes and no. I have a very long torso so if pants say "high waist" on the label they are usually mid-rise on my body. I found two pairs of pants I like Ross and one pair at TJMaxx. I also bought a new pair of jeans at JCP. I bought a Boyfriend Skinny Jeans and I really liked the fit better than the standard skinny jeans. I still get that slimmer fit through the leg without it being skin tight. I am so with you being over the winter!! However, this is a perfect winter outfit...love the leopard print scarf...adds a chic factor to the whole outfit!! Thanks Sarah! Winter can end anytime now as far as I'm concerned. Also, thank you so much for sharing with us at On Mondays We Link-Up!! You look lovely, Amy, despite it being very cold. And you're wearing a gilet - yes, I can see how it works better with just a thin padding. Maybe I should rethink my strategy! Thank you! Yes, if you want to wear a vest that isn't quite as bulky just go with a thinner one. I'm with you on the fall pictures. It's 100 degrees in Orange County in August/Sept...so there is no way I can post sweaters and scarves. It's lame. Anyways! My rant is over here too :) Hope you get some sunny skies and get to enjoy a little bit of spring soon! Thanks Shauna! It was so nice outside yesterday, but I think we're back in the 40's again for awhile. Spring is taking it's sweet time to arrive in Wisconsin. I know what you mean! I still have some snowy outfit pics I want to post on since we took time to take photos, but I am getting so sick of the snow and wintery layers! I love your fur infinity scarf though! You look super cute! Thanks Laura. I never know if I should hold on to those photos for next year or post them. Oh Amy I feel for you!! Our winters aren't as long as yours, but this time of year I can't stand the cold any longer!! Oh man I love the Fall weather! I'm probably one of those bloggers you'll yell at. :) But I feel your pain! I just want some nice sunny weather and totally dressing like and it and suffering in the cold for it. C'mon sun! LOL! You probably are! Just at least wait till September before talking about Fall. I want to enjoy every minute of my summer. You are such a trooper for taking photos in the snow, Amy! And I hear your pain about winter & spring!! Luckily we've been having fabulous weather here, so it's been nice to actually wear spring clothing. But I know we'll be having snow before June comes around! !